Automotive focus: Can your car be your mobile wallet? If automobiles are becoming a little like smartphones on wheels, why shouldn’t they make payments too? It was a bold claim, but a necessary one given the way consumers are feeling: research by Accenture says 39 per cent of the world’s drivers value connected tech higher than anything else when buying a new car. The same survey said just 14 per cent care most about power and handling. The world’s major auto manufacturers have been debating how to respond to this drastic change for at least a decade. They need to work out how to offer features like entertainment, assisted navigation, engine diagnosis, road side assistance and more. Some have built their own proprietary in-car systems for the purpose. But it’s complicated. These in-built communication systems might fit the bill for car stuff like engine status and calling emergency services. But entertainment? Phonecalls? Don’t drivers have smartphones for that? This is the major question facing auto manufacturers. They know that Apple and Google are waiting in the wings with, respectively, Apple CarPlay and Android Auto. But they don’t want to cede control of their in-car systems to tech firms. However, deep down they realise this is what their customers want. Perhaps in the end it all comes down to money. Half the cars sold in 2017 will have some kind of mobile connection and by 2022 there will be over a billion connected cars on the road, says Analysys Mason. If car makers can offer connectivity from their vehicles, maybe they can negotiate commercial partnerships and take a revenue share. They’re already experimenting. 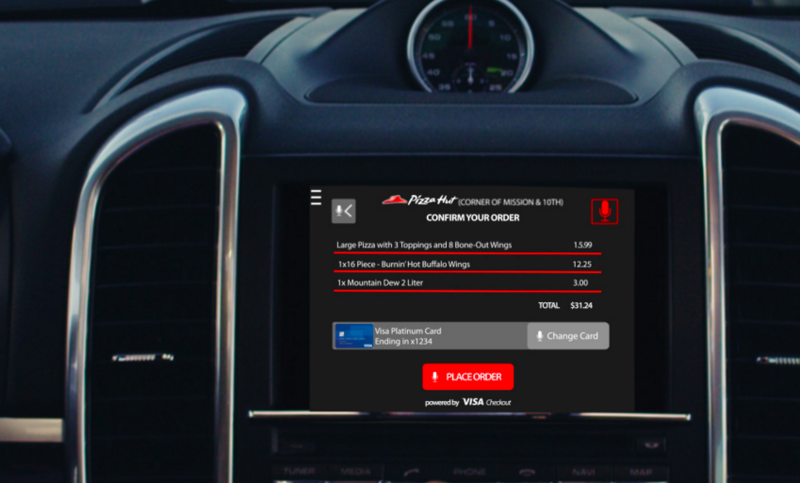 At last year’s Mobile World Congress, Visa debuted a pilot project to enable drivers to order ahead for various items direct from the in-car display. Motorists could load their Visa card details to the display and then touch it to order pizza. The software would then reveal turn-by-turn directions to the restaurant and a confirmation of when the order would be ready. Finally Bluetooth beacons would recognise the driver’s car and trigger the payment. Visa didn’t name the car maker in the trial, but did confirm Accenture and Pizza Hut as partners. It also said fuel stations were part of the test. In fact, ‘pay at pump’ has emerged in the last 12 months as a pretty busy area. It’s easy to see why. Paying for fuel/petrol is a largely old-school process for most drivers. This might be why US fuel giant Chevron teamed with Visa to launch a mobile payments programme at more than 20 Chevron-branded stations in California. Details of exactly how were pretty scarce. There was more specifics in Shell UK’s announcement of Fill-Up & Go, which lets drivers use a QR code, mobile app and smartphone to refuel. Here, users download the app and link it to a PayPal account. Then they select they amount of fuel they need, enter it into the app, then scan the code by the pump. Most of Shell’s 1000 service stations planning to offer it. Of course, these schemes do just what the car companies are watchful of: locate car-related features inside a smartphone app rather than on the dashboard of the vehicle. Which brings us to the latest big motor company idea: FordPass. Ford describes it as “a platform that reimagines the relationship between automaker and consumer”. That’s not too clear, though Ford does list some features including: talking to personal mobility assistants and receiving rewards for FordPass membership loyalty. And then there’s FordPay, which lets drivers pay for services such as car parking and fuel. Ford is also collaborating with ‘affinity partners’ McDonald’s, 7-Eleven and others so that ‘members can access merchandise and unique experiences’. It doesn’t say how, exactly, though there’s a video here. Clearly it will take a while for auto makers to decide whether they should play in the payments space – and for consumers to decide when/if they are ready to make payments from a car dashboard. But in a world where transactions are moving to the cloud, anything is possible.